America has voted, presumably, for The Next Food Network Star (the polling closed on Thursday; I missed placing my vote). Guy Fieri ("Off the Hook") is my choice. I'm so glad he's one of the two finalists. Reggie Southerland ("Simply Spectacular") is my wife's choice. I've posted before about Guy, and as I watched the last few episodes, I'm convinced he's the real deal. For his sample pilot, he made Tequila Turkey Fettuccine and Breathmint Pie, and I wanted to eat both those dishes (and I already had dinner!). That's when I know a TV chef is reaching me...when I want to eat what they're making. Good luck to both contestants this Sunday! I wish I could remember my life when I was born. When I was a baby. My little daughter begins a lot of her sentences with "When I was a baby...", I did this, I did that. "When I was a baby, Mommy cuddled me." "When I was a baby, you carried me to my crib." I'm far from those memories now. "When I was a baby, I was in the Philippines." "When I was a baby, my parents took pictures of me." I was born 38 years ago, as of yesterday. Hello baseball! 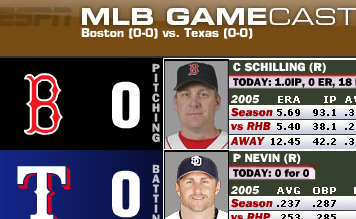 The Red Sox start their 2006 season in Texas, with Curt Schilling on the mound. 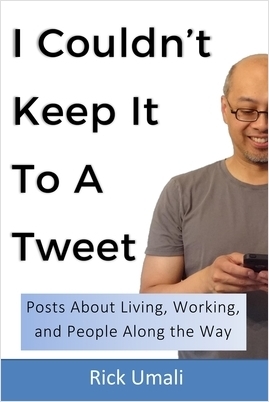 As I write this, it's scoreless. The Red Sox won, 7-2.